A couple of years ago I posted about the kitchen mini command center I made for our Texas home. One of the things that I mentioned was my bills and finances ledger. I’ve had so many e-mails and questions about it that I decided to give it its very own post! Even though my command center has had to be modified since we moved to New York, that finances ledger has remained the same–I’ve had it for a long time. I use this ledger almost every day. I pay the bills and handle the finances for our family, so I use it to stay organized and keep track of all of our financial information. My husband is also able to look at it whenever he wants to, and see exactly where we’re at and what’s going on–and find something quickly if I’m not at home. It’s a place where both of us have access to our information, which is really important. I use it to track our savings, bills that are paid and need to be paid, receipts, checking account balance and receipts, flex spending, tax info, and a variety of other financial information. It works really, really well for us, and I’m excited to share it with you, in case you’re looking for a way to keep all your bills and finances together. Yes, we have smartphones these days, with an app for just about everything you an imagine. I do my banking online, pay my bills online, and utilize the ease and convenience of technology. However, we still have paper items that need to be filed and organized, and honestly, there are some things that I still prefer laid out on paper. So, what’s in the ledger? Let’s take a look. I have sections that include: Checking Account Info, Savings Info, Bills to be Paid, Flex Spending, Taxes for both business and personal, and one that’s For Reference. I write down every transaction in a plain wire notebook–debits, withdrawals, checks, deposits. I keep a running balance of our account, so I know how much we have and and should have. It takes awhile for some transactions to show up in your account if you’re checking it online, so you shouldn’t solely rely on the current balance that’s listed–in case some of those transactions haven’t cleared yet. I also track it for accuracy, and I keep every receipt until it shows correctly on my statement. I prefer using the notebook as opposed to the teeny tiny book that they send when you order checks–I can write bigger, and I can fit in a whole lot more before needing a new one! Usually I only need to trade it out once a year, which means for the five years I keep them, they’re easy to store. Like I mentioned earlier, I keep all of my receipts until my statement shows the correct amount then I shred or burn them. I use 3-ring plastic zip pouches, and I have several of them. I can keep savings and checking receipts separate, and I also have pouches for tax receipts as well. They’re all in the same book, easy to find! I use the plastic dividers with pockets for all of my flex spending receipts and correspondence, and I also have a receipts pouch for smaller receipts. I have an Excel spreadsheet that I keep track of all the bills we have, when they’re paid, and how much was paid. I update it on the computer, but I keep a printout in my binder for reference. I can also print out the whole year, and have it in one glance. I have more of the pocket dividers to keep bills in that need to be paid, and invoice stubs that have been paid. I keep them until my check or payment clears my account. 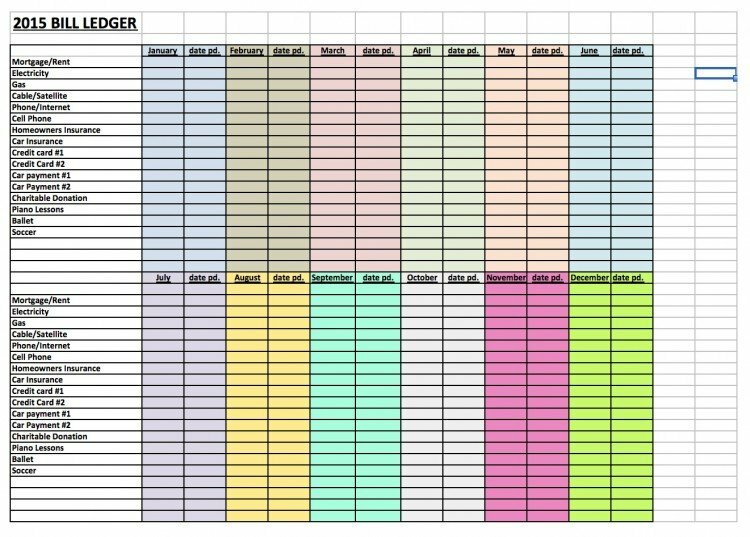 This is a sample of the spreadsheet I use, and you can download your own copy at the end of the post! It’s an excel file, so you can edit to fit your own needs. Again, I keep track of this on my computer in an Excel spreadsheet, but I keep a copy in my finance ledger. I like to have an all-in-one visual reminder of how much we’re saving each month, and the ongoing total. It really helps us to save more, and meet our goals. I have sections for both business and personal taxes, with the same wonderful plastic pocket dividers, plus tax receipt pouches. You can have separate pouches for different expenses, so it’s easy to keep them together and organized. At the beginning of the year, as tax information and paperwork starts arriving, I keep it in my folder until it’s time to file our taxes, then it goes into our long-term paper storage. The beauty of a finances ledger, is that you can include whatever is important to you–it an easily be customized to your financial life. I’ve used this method for many years, and love it. 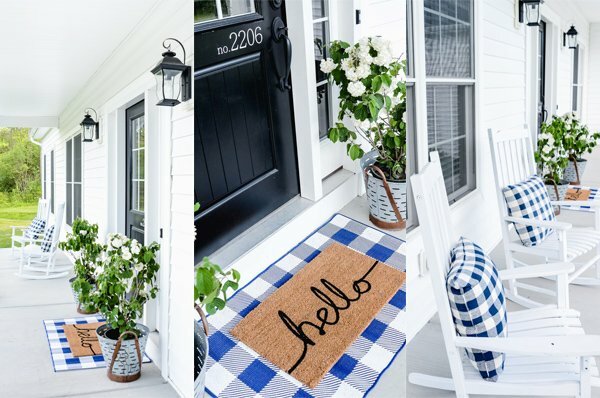 It’s just so nice to everything in one place–easy to find, totally organized! I’m sharing the printables with you today, in case you’d like to use them! I have the binder cover, spine printable, both the bills and savings spreadsheets, and the receipt and tax receipt labels! For the labels, use Avery 8160. The spreadsheets are excel files, which you can edit for your own specific needs. 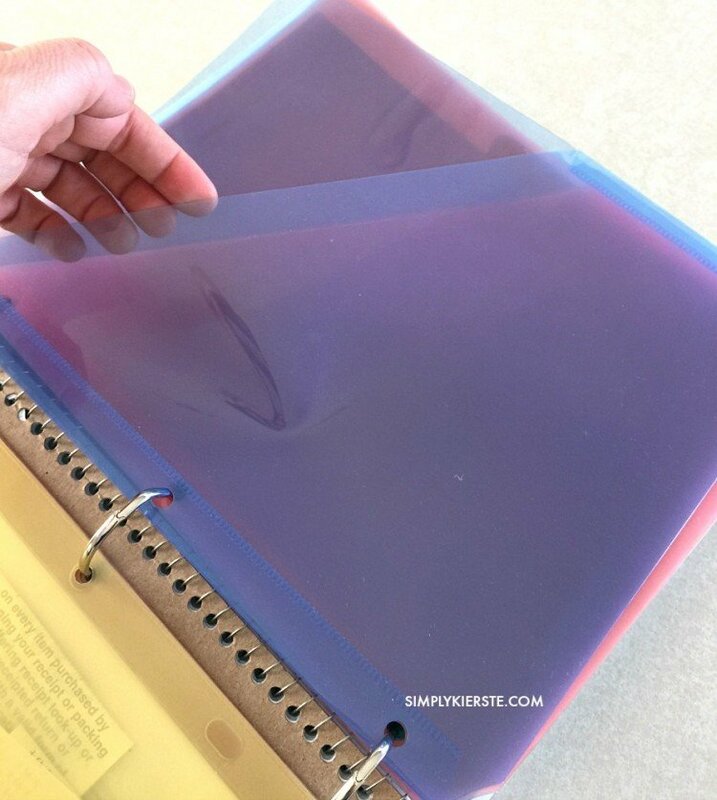 Print the binder and spine, then trim to fit! This is such a great resources! We keep all our receipts and bills but we just throw them in a drawer. Then when I need something I have to dig through everything. This looks so much more organized. I will have to try it. I think it’s super important like you said to keep a physical record and keep track of your spending even with all the technology. Last year I had a doctor bill that I paid not show up as applied to my account. Luckily, I had the receipt and they were able to track the payment and find out they had applied it to someone else’s account. If I hadn’t been keeping track and saved my receipt who know what would have happened. Julie, I’ve had similar experiences with saving my receipts, and it has saved me a lot of money over the years! Glad you had yours too. Oh my heavens! This is fantastic! We are starting our own business, and this will surely help us keep our ducks in a row! Thank you so much for posting this and letting us have the printables and downloads! You are awesome! Also I have always lacked in keeping a ledger for our bank account. I usually just log in online and check if everything has cleared. 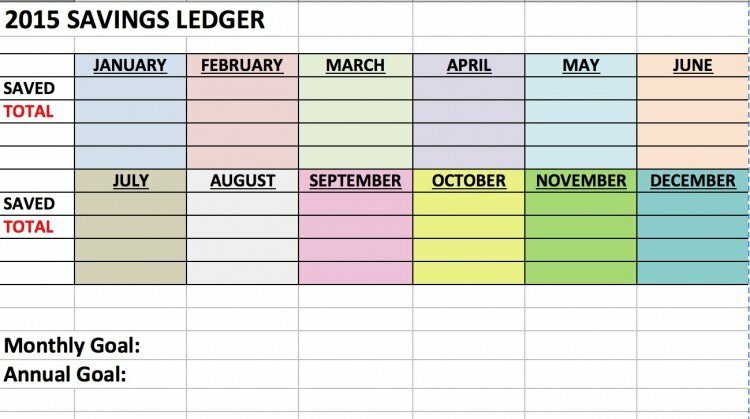 I’m teetering on the idea of trying to keep a ledger your way. It just makes sense! What do you use for your flex spending? Is it a medical account, or is that what you count as money for food, toiletries and stuff like that? I love this idea and want to use it but I just had a question on that. I think my husband will love this. He always wants to know what he have to pay. Thanks! We have money taken out of my husband’s paycheck into a flex spending account for medical expenses–copays, deductibles, prescriptions, etc. We have to keep receipts, and then submit them for reimbursement. That section is a place for me to keep all the receipts, bills, and everything else in order to keep it all straight! Thank you for this post. I have a system for my bills and papers but it hasn’t been working at all. This post gave me some new ideas to change things up and hopefully find a way to manage things better. I think this will also help me show my husband quickly what is going on or he can look himself instead of always asking me. I am new to your site but excited about the things I have seen. You are so welcome! I’m glad you found some ideas that will help. Being able to keep my hubby in the loop easily is one of my favorite things about it too! Hi! About a year ago, I took your ideas for the command center and made one which has different hanging folders for “Bills to be Paid”, things to be filed, Tax Info, and folders for each family member. It is working GREAT and I love that it keeps everything organized and my counters clutter free. 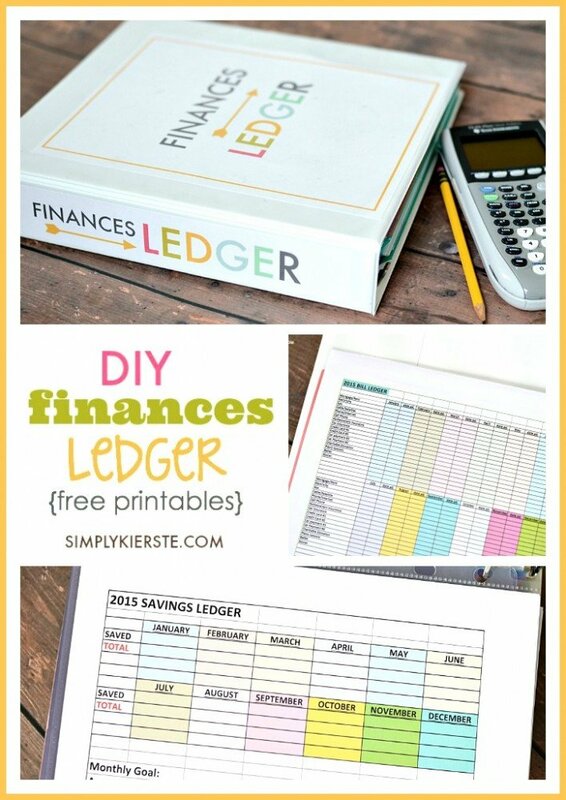 I do like the idea of your finance ledger and keeping the finance stuff in a binder as opposed to individual folders and am thinking of “tweaking” my system. I do have a really dumb question though…… I like that you use a regular wire notebook for your ledger in that it lasts longer, easier to file when done and more room to write (I’ve always just used the little ones that come with the checks and my bank makes you pay for them). What do you do, for instance, when you write checks when you are out? I assume you take your receipts and record them when you get home in your ledger, but do you have anything with your checks (like the little register) so you will know what your balance is when you are out or do you just look at the balance before you leave and know what you have to spend? Just curious because when I’m out running errands I have my checkbook/ledger with me so I know what I have to spend and if I have a lot of stops/purchases to make, I can keep the total current as I go. Sorry for the long message, but was just trying to figure out if it would work for me. Great idea, as usual!! Such a great question, thanks for asking! I understand exactly what you’re talking about, because before I switched over to the notebook, I carried my small bank ledger with my everywhere. I rarely write checks, and if I do, they are for monthly items like paying for piano lessons, violin lessons, sports, etc. They are easy to keep track of, because I do them every month. Whenever I go out and I’m planning to buy something, I glance at my ledger, and see what my running balance is, so I know how much I have. I make sure that when I get home, receipts are written down if not that day, the next day, so it’s as accurate as possible. I’ve never missed not having that small ledger! It’s worked out really well, and I’m so glad I made the switch. Oh My Goodness, why have I never just used a notebook! so simple!!! But I do have a question for you, do you keep a column to check off when things clear? Or to balance from with the actual statement at the end of the month??? I do check them off–right next to the amount–once it clears. I balance my account online with my notebook ledger once a week or bi-weekly. If there is anything on a notebook page that doesn’t clear when everything else has, I circle the amount, so it’s easier to find at a later date. I really do love the notebook–so easy and lasts forever!! Good question! And yes, that’s exactly what I do. I keep the receipts, then write them in my notebook, but not every day. More like every few days, or even once a week, depending on how much spending is going on. I usually don’t shop/do errands more than once a week, so it’s not a big deal for me. Or if I do, it’s just one or two receipts if it’s an extra day out. It’s still easier than trying to write them down while I’m in the store, because there’s always someone behind me, and I never have enough time to write down all the info I wanted to. I always make sure to do it before a day of errands, so I’m up to date on our current balance. It really has worked out well for me, and has ended up saving me time overall, plus so much easier than anything I’ve done before! Thank you so much for sharing this…especially in a way that’s easily understandable. Much appreciated. This will help me get back into keeping track of my finances in a workable, ordered way. The check register sample does not have a column for deposits. Where do you enter those? I write them in the same spot as the debits, except I put a little + next to it, so I know it’s a deposit!